The Berenstain Bears Storybook Bible for Toddlers is perfect for young children. Now toddlers have a padded board book edition designed just for them, with simple text, bright art, and a padded cover. This cute and durable edition provides an overview of the Bible with eight stories from the Old and New Testaments that follow the Bear family as they explore Scripture. The Berenstain Bears Storybook Bible for Toddlers is fun and enlightening for kids and a great resource for parents and educators. Kids will love The Berenstain Bears Storybook Bible for Little Ones! 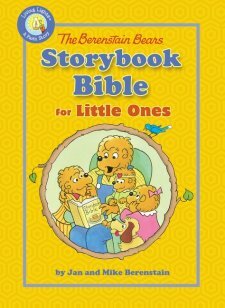 The Berenstain Bears Storybook Bible for Little Ones is made up of four stories from the New Testament and four stories from the Old Testament. My kids all enjoyed this storybook Bible and we all particularity liked the illistrations because they include the Berenstain bears which of course are a favorite in our house. is a board book which I love because board books seem to stand up to little ones better. I also like that pages are thicker because it helps little ones turn the pages on their own. This is the perfect storybook Bible for kids aged 0-3! You can find The Berenstain Bears Storybook Bible for Little Ones on Amazon, Barnes and Noble and other bookstores.